Why did Shakuni call Yudhishtira older than him in age? The shloka doesn't say that Yudhishtira was elder in age to Shakuni. It just says that Yudhishtira was of a mature age at that time. Shakuni was playing on behalf of Duryodhana, it seems that translator has translated this verse in that sense that Yudhishtira was elder to Duryodhana. Both Shakuni and Yudhishthira were Kshatriyas. So, IMO Shakuni's behavior can be explained if we take into account the following verse, which says, that a Kshatriya's seniority depends on his valour (ViryavattA) and not on his actual age. Similarly, a Brahmin's seniority depends on his learning and knowledge. Manu Smriti 2.155. The seniority of Brahmanas is from (sacred) knowledge, that of Kshatriyas from valour, that of Vaisyas from wealth in grain (and other goods), but that of Sudras alone from age. Manu Smriti 2.156. A man is not therefore (considered) venerable because his head is gray; him who, though young, has learned the Veda, the gods consider to be venerable. 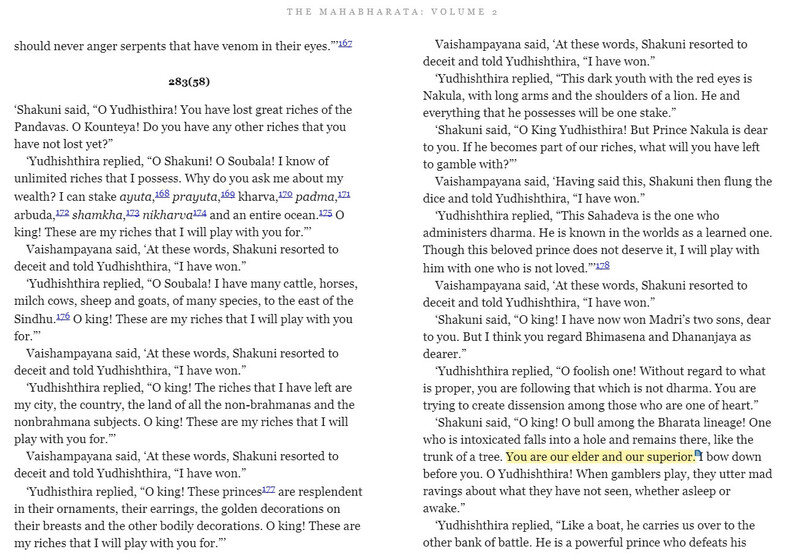 So, Shakuni's way of addressing Yudhisthira may be related to the fact that Yudhishthira was more valourous than Shakuni was. Or, at least, Shakuni considered it to be so. Not the answer you're looking for? Browse other questions tagged mahabharata yudhisthira shakuni .